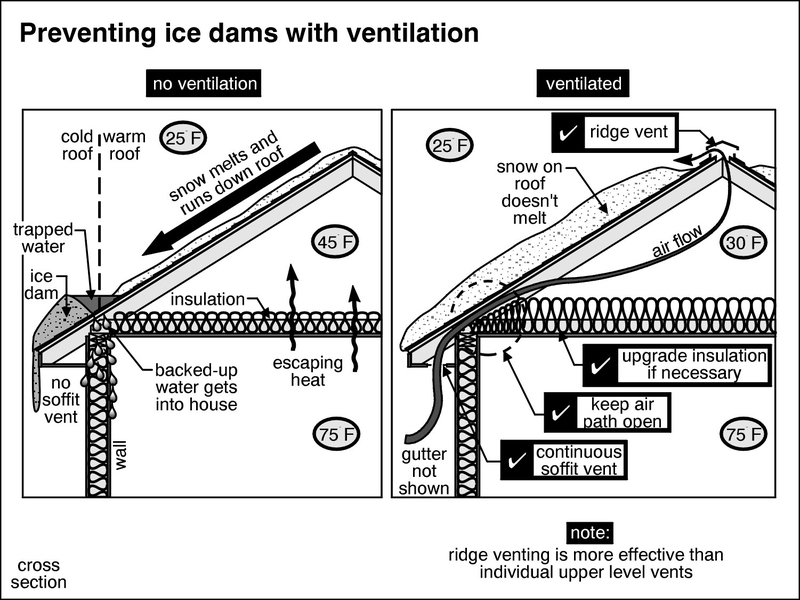 These conditions can cause roof snow to melt and slide down to the eaves, where the roof surface is cooler and the melting snow freezes to the roof. The melting ice and snow causes water to pool behind this dam and icicles to form at the eaves. Sometimes the water backs up and seeps between the shingle layers, wetting the roof sheathing, and often leaking into the walls and ceilings of the interior spaces below. Inspected by 42 - Home Inspections provides a consulting service using an infrared camera to pin point specific locations in the attic where warm air is leaking into the attic space. 3. Make sure that soffit vents are not blocked by insulation. Use appropriate baffles/barriers between the rafters/trusses to avoid loose fill/blown-in insulation from settling in the eaves. A minimum insulation value of R-40 to R-50 is recommended, and it is generally better to insulate to a higher R-value than the minimum recommended level. 4. Make sure that eaves troughing,downspouts and downspout extensions are able to discharging water. 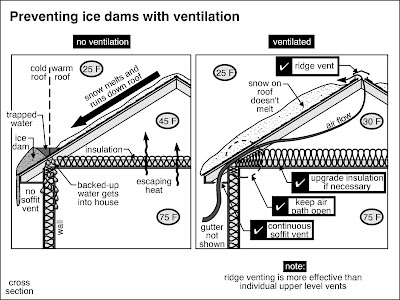 Eaves troughing that is not properly sloped or not cleared of leaves and debris, can also cause ice dams. 5. All homes are different, you can always contact a roofing professional for expert for advice if you have a ice dam problem that persists. For a very detailed and professional Ottawa home inspection, ice dam consultation or infrarad scan, call (613-799-3698) or email Barry at Inspection by 42 Home Inspections (barry@inspectedby42.com. We inspect homes in Carp, Bridlewood, Bells Corners, Manotic, Greely, Constance Bay, Kanata, Ottawa, Barrhaven, Orleans, Stittsville and surrounding areas.